A traveler who calls New Delhi home, Karan has seen first hand the massive inefficiencies that impact cities in India when workforces are delayed by rain. His hobby in photography and eye for design helped frame and communicate the problem. In the past, he has created long term strategies for an international NGO and improved operations for a multi-million dollar restaurant chain. His leadership ensures the values, direction, and growth of the company. Karan is also a dedicated football player. He has captained the Tufts University soccer club, and has played semi-professionally since 2009. A former All-American swimmer, Andrew instills habits of focused training and steady execution to the founding team. His is our counsel in sales, finance, and corporate development. Andrew has built financial models and scenarios that have gained funding from investors, technology development boards, and business plan competitions. No longer swimming competitively, Andrew enjoys being the best ping-pong player on the team. He is a zealous reader and always likes a great story - told or written. After developing marketing strategies for a probiotics company, Max immersed himself in the consumer market of India. As the head of marketing and partnerships, Max believes in the power of storytelling and history as vehicles for introducing new products to market. An interesting man to complement our products, Max has been a gaucho in Uruguay, a marine mammal trainer in Boston, a rice trader in Buenos Aires, and has also lived in France and India. His appetite for living new adventures embodies the motorcyclist spirit. 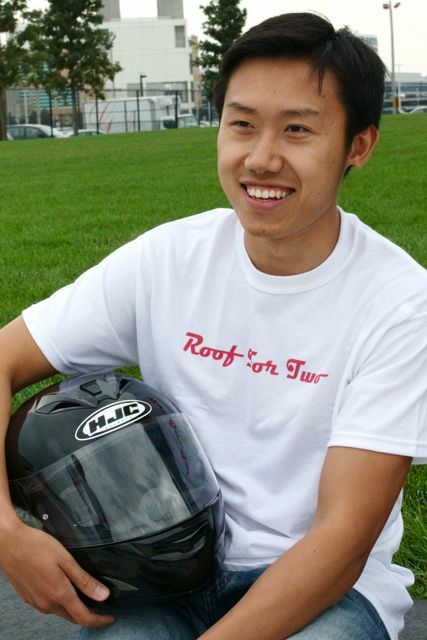 David is the creative and conceptual designer behind the Roof For Two products. He comes from a background in biological research and development. The scientific method and elegant experiment design have inspired his approach to crafting our products and leading the engineering team. Completely self-taught in industrial design and prototyping, David designs functional pieces that are made for movement. David's innate skills in sketching and conceptualizing bold design create the look and functional themes of Roof For Two.